Universal sauna heater for dry Finnish sauna. 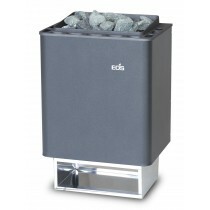 Optimal relation between stone volume and air convection system for fast heat-up times and powerful water infusions. Contemporary, elegant die-cast aluminium top Scratch resistant anthracite pearl effect powder-coating. Made for use of up to 20 hours a week.